Other main organizers include the anti-Israel International Solidarity Movement (ISM), as well as far-left socialists from Europe and the United States. Many of the flotilla's main organizers have stated that its prime aim is to create provocations and harm Israel's image. Following Israel's Operation Cast Lead in Gaza, which ended in January 2009, a series of international conferences was held in Turkey to restructure the struggle against Israel. A conference in February 2009 featured 200 radical Islamist scholars who came to meet with senior Hamas officials to plot a new, "third jihadi front" (in addition to Pakistan and Iraq) centered on Gaza. The conference gave birth to the infamous, pro-Hamas Istanbul Declaration, which also provided justification for attacking foreign navies which might try to prevent arms smuggling to Gaza. Thus, the flotilla is far from being a peaceful, humanitarian effort to support the Palestinians in Gaza. It should instead be seen as a major, pro-Hamas effort to delegitimize Israel by a "red-green alliance" of leftists and Islamists. Why are they trying to keep this secret??? British Foreign Secretary William Hague said Wednesday that Iran has conducted covert tests of ballistic missiles alongside a 10-day program of public military maneuvers. Mr. Hague told the House of Commons there had been secret experiments with missiles and rocket launchers. Iran is conducting 10 days of war games in an apparent show of strength to the West and on Tuesday fired 14 missiles in public tests. Britain believes Tehran has conducted at least three secret tests of medium-range ballistic missiles since October. Palestinian Authority President Mahmoud Abbas has officially decided to go to the United Nations in September to ask for recognition of a Palestinian state along the pre-1967 lines. But how can Abbas go to the UN in New York when he cannot even go back to his home in the Gaza Strip, which has been seized by Hamas? How can he go to the UN when he cannot visit the Gaza Strip, where more than 1.5 million Palestinians live? How can Abbas go to the UN when he cannot even visit a refugee camp in the West Bank, Lebanon or Syria? Even if the UN votes in favor of a Palestinian state in September, how does Abbas plan to implement the decision on the ground? Can he really convince Hamas and Palestinian refugees to accept the two-state solution and abandon the "right of return" to Israel proper? Hamas, which represents many Palestinians, has made it clear that it would never recognize Israel's right to exist or accept the two-state solution. Hamas will, of course, reject any UN resolution calling for the establishment of a state "only" within the pre-1967 lines. Hamas's goal is to replace Israel with an Islamic state that may allow some Jews to live under its jurisdiction as a minority. Hamas wants all the land, from the Mediterranean to the Jordan River. That is why any resolution adopted by the UN would not bring everlasting and comprehensive peace to the Middle East. Tomorrow marks the five-year anniversary of the Hamas raid into Israel in which Gilad Shalit was wounded and then dragged through a tunnel into the Gaza Strip, where he remains in captivity to this day. To mark the occasion, 12 prominent “human rights” organizations, including Amnesty International, Human Rights Watch, and B’Tselem, have issued a joint statement. If a better example of the utter moral collapse of the human rights community exists, it would be hard to find. The statement is one of passionless brevity — just a few sentences long — and expresses no opinion on the standing of Hamas, or on its 2006 raid into Israel, or on the legitimacy of its goals and methods. Remarkably, it doesn’t even demand the release of Gilad Shalit. The most that this allegedly courageous and principled human rights community could bring itself to say to the terrorists of Hamas is that they should improve the conditions of Shalit’s imprisonment. You can read the statement on Human Rights Watch’s website. There is no doubt that Israel is superior to all Arab countries in the sphere of Information Technology, a comparative study between Arab nations and Israel on ‘Scientific Research and Patent Rights Compared’ conducted by Dr Khalid Said Rubaia, a Palestinian researcher at American Arab University in Palestine, says. Israel spends 4.7 percent of its total GDP on scientific research, which is the highest in the world. However, Arab states are spending 0.2 percent of their total incomes and Asian Arab countries around 0.5 percent of their incomes on research, said the report. Regarding patent rights, Israel has registered 16,805 patents. However, Arab countries have only 836 patents which is 5 percent of what Israel has. Israel spends 0.8-1 percent of the total expenditure of the world on research work and Arab states spend 0.4 percent. It means Israel spends more than double that spent by Arab countries in this field. Israel spends 4.7 percent of its income on research. However, Arab countries spend 0.2 percent of their total income on the same. United States spends about 2.7 percent of its income, UK 1.8 and Germany 2.6 percent on research work. Iran is moving to cement ties with the leaders of three key American allies—Afghanistan, Pakistan and Iraq—highlighting Tehran's efforts to take a greater role in the region as the U.S. military pulls out troops. The Afghan and Pakistani presidents, visiting Tehran, discussed with Iranian President Mahmoud Ahmadinejad "many issues…that might come up after the NATO military force goes out of Afghanistan," Iranian Foreign Minister Ali Akbar Salehi said in an interview here Sunday. The Egyptian-brokered reconciliation agreement between Hamas and Fatah, which was announced last month in Cairo, appears to have ended before it started. It now turns out that the gap between the two rival parties remains as wide as ever, in spite of the accord. Hamas and Fatah continue to disagree on almost everything. They disagree on who would head a new Palestinian unity government, on members of the government, on the government's political platform, on the future of the peace process with Israel, on security coordination with Israel, on the Palestinian Authority's relationship with the United States and European Union and on the role of the Palestinian security forces in the West Bank and Gaza Strip. But there are other things where Fatah and Hamas do see eye to eye. Both parties agree on the need to restrict freedom of speech and the media. The two Palestinian governments continue to display intolerance toward any form of criticism, regardless of its source. Palestinian journalists and political activists who dare to criticize the governments in the West Bank and the Gaza Strip face arrest, harassment and intimidation. This explains why there is not a single Palestinian opposition newspaper in the West Bank or in the Gaza Strip. Hamas and Fatah also agree on the need for each party to stay in power at all costs. That's why they don't want to hold new elections. In many ways, the status quo is not bad for the two parties. In the West Bank, the Palestinian Authority continues to receive millions of dollars in financial aid from the international community. The Palestinian Authority's leaders hold Israeli-issued VIP cards that allow them to travel freely, especially to fancy hotels and restaurants in Tel Aviv. The VIP cards also allow the Palestinian leaders to pass through Israeli checkpoints without having to wait in line together with ordinary Palestinians. Last week I had a rather ambivalent experience at the London School of Economics which may point to something beyond the personal—indeed, about where Britain, and possibly Western Europe as a whole, are heading. I was invited to lecture on the first Arab-Israeli war of 1948. A few hours earlier, a fire had broken out in a nearby building and Kingsway was sealed off, so the taxi dropped me off a few blocks away. As I walked down Kingsway, a major London thoroughfare, a small mob—I don't think any other word is appropriate—of some dozen Muslims, Arabs and their supporters, both men and women, surrounded me and, walking alongside me for several hundred yards as I advanced towards the building where the lecture was to take place, raucously harangued and bated me with cries of "fascist," "racist," "England should never have allowed you in," "you shouldn't be allowed to speak." Several spoke in broken, obviously newly acquired, English. Violence was thick in the air though none was actually used. Passersby looked on in astonishment, and perhaps shame, but it seemed the sight of angry bearded, caftaned Muslims was sufficient to deter any intervention. To me, it felt like Brownshirts in a street scene in 1920s Berlin—though on Kingsway no one, to the best of my recall, screamed the word "Jew." In the lecture hall, after a cup of tea, the session, with an audience of some 350 students and others, passed remarkably smoothly. Entry required tickets, which were freely dispensed upon the provision of name and address. The LSE had beefed up security and several bobbies stood outside the building confronting the dozen or so demonstrators who held aloft placards stating "Benni Morris is a Fascist," "Go home," etc. Inside, in the lecture hall, surprisingly, there was absolute silence during my talk; you could have heard a pin drop. The Q and A session afterwards was by and large civilized, though several Muslim participants, including girls with scarves, displayed anger and dismissiveness. One asserted: "You are not an historian"; another, more delicately, suggested that the lecturer "professes to be a serious historian." However, the overwhleming majority of the audience was respectful and, in my view, appreciative (to judge by the volume of clapping at the end of the lecture and at the end of the Q and A), but a small minority jeered and clapped loudly when anti-Zionist questions or points were raised. The manner of our exit from the lecture hall was also noteworthy. The chairman asked the audience to stay in their seats until the group on stage departed. I was ushered by the security team down an elevator and through a narrow basement passage full of kitchen stores and out a side entrance. Like an American president in a B-rated thriller. Is this the voice of peace??? In response to Kul Al-Arab's question "Do you still believe in two states for two peoples?" Sha'th said: "We do not recognize anything called the state of the Jewish people. We are prepared to recognize the State of Israel, if they say that the Israeli people includes those Muslim and Christian residents who are the true owners of the land. But we do not agree to [two states] for two peoples, which means that Israel belongs to the Jewish people. [Israel must] belong to everyone who lives there, and first and foremost to its original inhabitants. We have never agreed, and never will agree, under any circumstances, to recognize Israel as the state of the Jewish people. "To begin with, we rejected the Partition Plan, and they [the Jews] implemented it only in terms of what concerned them. If they want to implement the plan [as it is written], we will reconsider [our] position and ask for 44 percent of Palestine, rather than 22 percent – in which case all of the Jezreel Valley will be part of Palestinian territory. "There is a chance for two states: a Palestinian state and a non-Jewish State of Israel. We want a solution that will ensure the rights of the refugees and protect the rights of those Palestinians who live in Israel, since protecting their rights is part of our strategy. The discussion of one state is altogether impossible." Is there an official dress code somewhere??? This year, however, Iran's summer fashion offensive appears bigger and more ominous, and has expanded the watch list to men's hairstyles and jewelry considered too Western. The U.S. has a large stake in the outcome in Libya. Not because of its oil production but because of the dangerous nature of the Gadhafi regime—made far more dangerous by the current conflict—and because of the effect that Libya can have on the rest of the Arab world at a critical time in history. Libya may not rise to the level of a "vital interest," as Secretary of Defense Robert Gates and others have assured us, but preventing it from becoming a haven for terrorists if Gadhafi survives comes very close. And while Libya is not as important as Egypt, as Vice President Joe Biden has told us, what happens in Libya affects Egypt and much of the Arab world. The Libyan fighting has burdened Egypt's weak economy with tens of thousands of additional unemployed that it can ill-afford. The same is true for Tunisia. In Libya itself, the U.S. might gain a much-needed friend in the Arab world. A British diplomat in Benghazi, the unofficial temporary capital of free Libya, has said that it is the first time during his many years in the Arab world that he has seen American flags displayed in appreciation. Even in Tripoli, still under Gadhafi's control, people go to the rooftops to whistle in celebration during NATO bombing raids. After a visit to Benghazi last month, Assistant Secretary of State Jeffrey Feltman wrote: "Imagine walking in the main square of a teeming Arab city and having people wave the American flag, clamor for photographs with a visiting American official, and celebrate the United States as both savior and model." Appreciation for the United States in the Arab world is something to be welcomed at any time, but particularly now when demands for freedom are sweeping across the Middle East. Yet here in the United States, there seems to be little appreciation for this or for the brave Libyans who are fighting for their freedom with such courage. Elena Bonner speech at the Oslo Freedom Forum.. In his invitation to this conference, the president, Thor Halvorssen, asked me to talk about my life, the suffering I have endured, and how I was able to bear it all. But today all that seems to me quite unnecessary. At the age of 14, I was left without my parents. My father was executed, my mother was sent for 18 years to prison and exile. My grandmother raised me and my younger brother. The poet Vladimir Kornilov, who suffered the same fate, wrote: “And it turned out that in those years there were no mothers. There were grandmothers.” There were hundreds of thousands of such children. Ilya Ehrenburg called us “the strange orphans of 1937”. Then the war came. My generation was cut off nearly at the roots by the war, but I was lucky. I came back from the war. I came back to an empty house. My grandmother had died in the blockade of Leningrad. Then came a communal apartment, six half-hungry years of medical school, falling in love, two children, and the poverty of a Soviet doctor. But I was not alone in this. Everyone lived this way. Then there was my dissident period followed by exile. But Andrei and I were together! And that was real happiness. Today, summing up my life (at age 86, you think about this every day you’re still alive), I can sum up my life in three words. My life was typical, tragic, and beautiful. Whoever needs the details -- read my two books, Alone Together and Mothers and Daughters. They have been translated into many languages. Read Sakharov’s Memoirs. It’s a pity his Diaries haven’t been translated; they were published in Russia in 2006. Apparently, the West isn’t interested now in Sakharov. The West isn’t very interested in Russia either. There are no real elections there, no independent courts, and no freedom of the press. Russia is a country where journalists, human rights activists and migrants are killed regularly, almost daily. And extreme corruption flourishes of a kind and extent that never existed earlier in Russia or anywhere else. So what do the Western mass media discuss mainly? Gas and oil -- of which Russia has a lot. Energy is its only political trump card, and Russia uses it as an instrument of pressure and blackmail. And there’s another topic that never disappears from the newspapers -- who rules Russia? Putin or Medvedev? But what difference does it make, if Russia has completely lost the impulse for democratic development that we thought we saw in the early 1990s. Russia will remain the way it is now for decades, unless there is some violent upheaval. During the years since the fall of the Berlin wall, the world has experienced incredible changes in an exceptionally short period. But has the world become better, or more prosperous for the six billion 800 million people who live on our small planet? No one can answer that question unambiguously, despite all the achievements of science and technology and that process which we customarily call “progress”. It seems to me that the world has become more alarming, more unpredictable, and more fragile. This alarm, unpredictability, and fragility is felt to some extent by all countries and all individuals. And civic and political life becomes more and more virtual, like a picture on a computer screen. Even so, the picture of life, formed by television, newspaper or radio remains the same as earlier -- there is no end to the conferences, summits, forums, various competitions -- from beauty contests to eating sandwiches. There is talk about people coming together -- but in reality, they are growing apart. And that isn’t because an economic depression suddenly burst forth, and swine flu to boot. This began on September 11. At first, anger and horror was provoked by the terrorists who knocked down the Twin Towers of the World Trade Center and by their accomplices, the shahids, suicide bombers who blew themselves up together with discotheques, wedding parties, and many civilian targets in London, Madrid and other cities; their families were paid $25,000 by Saddam Hussein for these atrocities. Later, Bush was blamed for everything, and as always, the Jews -- that is, Israel. An example was the first Durban Conference, and the growth of anti-Semitism in Europe, noted several years ago in a speech by Romano Prodi. Then there was Durban-2; the main speaker was Ahmadinejad proposing to annihilate Israel. So it is about Israel and the Jews that I will speak. And not only because I am Jewish, but above all because the Middle Eastern conflict since the end of World War II has been a platform for political games and gambling by the great powers, the Arab countries and individual politicians, striving, through the so-called “peace process,” to make a name for themselves, and perhaps win a Nobel Peace Prize. At one time, the Nobel Prize was the highest moral award of our civilization. But after December 1994, when Yasir Arafat became one of the three new laureates, its ethical value was undermined. I haven’t always greeted each selection of the Nobel Committee of the Norwegian Storting with joy, but that one shocked me. And to this day, I cannot understand and accept the fact that Andrei Sakharov and Yasir Arafat, now posthumously, share membership in the club of Nobel laureates. In many of Sakharov’s publications (in his books Progress, Coexistence and Intellectual Freedom and My Country and the World, in his articles and in his interviews), Andrei Dmitrievich wrote and spoke about Israel. I have a collection of citations of his writing on this topic. If it were published in Norway, then many Norwegians would be surprised at how sharply their contemporary view on Israel differs from the view of Sakharov. Throughout the years of Israel’s existence there has been war. Victorious wars, and also wars which Israel was not allowed to win. Each and every day -- literally every day -- there is the expectation of a terrorist act or a new war. We have seen the Oslo Peace Initiatives and the Camp-David Hand-shake and the Road-map and Land for Peace (there is not much land -- from one side of Israel on a clear day you can see the other side with your naked eye). Now, a new motif is fashionable (in fact it’s an old one): “Two states for two peoples.” It sounds good. And there are no objections inside the peace-making Quartet, made up of the U.S., the UN, the EU, and Russia (some great peace-maker, with its Chechen war and its Abkhazian-Ossetian provocation). The Quartet, and the Arab countries, and the Palestinian leaders (both Hamas and Fatah) put additional demands to Israel. I will speak only of one demand: that Israel accept back the Palestinian refugees. And here a little history and demography are needed. According to the UN’s official definition, refugees are considered those who fled from violence and wars, but not their descendants who are born in another land. At one time the Palestinian refugees and the Jewish refugees from Arab countries were about equal in number -- about 700-800,000. The newly-created state Israel took in Jews (about 600,000). The UN officially acknowledged them as refugees (Resolution 242), but did not help them. Palestinians, however, are considered refugees not only in the first generation, but the second, third, and now even the fourth generation. According to the UN Works and Relief Agency’s report, the number of registered Palestinian refugees has grown from 914,000 in 1950 to more than 4.6 million in 2008, and continues to rise due to natural population growth. The entire population of Israel is about 7.5 million, of which there are about 2.5 million ethnic Arabs who call themselves Palestinians. Imagine Israel then, if another five million Arabs flood into it; Arabs would substantially outnumber the Jewish population. And adjacent to Israel a Palestinian state will be created, completely cleansed of Jews. In addition to the demand that Palestinian refugees return to Israel, there is also the demand that Israel give Judea and Samaria to Palestinians and cleanse the area of Jews -- today in Gaza, there is not a single Jew. The result is both strange and terrifying, not only because Israel will essentially be destroyed – after all, it will be another time and other Jews. It is terrifying because it shows what a short memory the august peace-making Quartet, their leaders and their citizens will demonstrate if they let this happen. Because the plan “two states for two peoples” is the creation of one state, ethnically cleansed of Jews, and a second one where there will be the potential to do the same thing. A Judenfrei Holy Land. The dream of Adolph Hitler will at last be realized. So think again, those who are capable of objective thinking, who are the fascists today and where can they be found? And another question that has been a thorn for me for a long time. It’s a question for my human rights colleagues. Why doesn’t the fate of the Israeli soldier Gilad Shalit bother you in the same way as the fate of the Guantanamo prisoners? You fought for and won the opportunity for the International Committee of the Red Cross, journalists, and lawyers to visit Guantanamo. You know the conditions of the prisoners, their lives, their food. You have met with those prisoners who have suffered torture. The result of your efforts has been a ban on torture and a law to close this prison. President Obama signed it in the first days of his coming to the White House. And although he, just like Bush before him, does not know what to do with the Guantanamo prisoners, we can hope that the new Administration will think up something. But during the two year Shalit has been held by terrorists, the world human rights community has done nothing for his release. Why? He is a wounded soldier, and should fall under the protection of the Geneva Conventions. The Conventions say clearly that hostage-taking is prohibited, that representatives of the Red Cross should be allowed to see prisoners of war, especially wounded prisoners, and there is much else written in the Geneva Conventions about their rights. The fact that representatives of the Quartet conduct negotiations with the people who are holding Shalit in an unknown location, in unknown conditions, vividly demonstrates their scorn of international rights documents and their total legal nihilism. Do human rights activists also fail to recall the Geneva Conventions? And yet I still think (and some will find this naïve) that the first tiny, but real step toward peace must become the release of Shalit. Release, and not his exchange for 1000 or 1,500 prisoners who are in Israeli prisons serving court sentences for real crimes. Thirty-four years have passed since I came to this city to represent my husband, Andrei Sakharov, at the 1975 Nobel Prize ceremony. I loved Norway. The reception I received filled me with joy. Today, I feel Alarm and Hope (the title Sakharov used for his 1977 essay written at the request of the Nobel Committee). What if Jews had followed the Palestinian path??? Guess who called the Palestinians trash??? The mufti of Lebanon, Sheikh Mohammed Rashid Qabbani, was quoted this week as saying that Palestinians are no longer welcome in his country. He also condemned Palestinians as “trash,” and said that he’s not afraid of their weapons. Sheikh Qabbani’s remarks were made during a meeting he held in his office in Beirut with a Palestinian delegation, representing refugees and various Palestinian factions in Lebanon. More than 400,000 Palestinians live in Lebanon, most of them in extremely harsh conditions in refugee camps. It is time that someone in Washington started asking Abbas whether he has a clear mandate from his people to make historic decisions, including signing a peace agreement with Israel. As the Palestinian Authority continues to threaten to ask the United Nations in September to recognize a Palestinian state along the pre-1967 lines, someone needs to ask President Mahmoud Abbas whether he really has a mandate from his people to embark on such a step. Today, there is no Palestinian leader who has a mandate to make any concessions to Israel in return for peace – especially when it comes to explosive issues such as the future of Jerusalem or the "right of return" for Palestinian refugees. The US Administration needs to ask Abbas whether he is also speaking on behalf of millions of Palestinians living in the Gaza Strip and around the world. It is not even clear these days if Abbas speaks on behalf of a majority in the PLO and Fatah. Abbas's term in office expired in early 2009 and since then Palestinians haven't been given a chance to choose a new president through free and democratic elections. Abbas has used Hamas's violent takeover of the Gaza Strip [in 2007] as an excuse for not holding parliamentary or presidential elections in the Palestinian territories. This sounds like a reasonable excuse in light of the split between the West Bank and Gaza Strip and Hamas's refusal to allow Palestinians to go to the ballot boxes. The Hamas-Fatah power struggle has also paralyzed parliamentary life in the Palestinian territories. The Palestinian parliament, which is known as the Palestinian Legislative Council, has ceased to function since Hamas's takeover of the Gaza Strip. In the absence of parliament and elections, the international community needs to ask Abbas about the decision-making process in the Palestinian territories and whether he represents a majority of Palestinians. Another biased IPCC report: This time Greenpeace wrote the report! He. Needs. To. Be. Removed. I have just been forwarded what appear to be Syrian state documents leaked by the governor of al-Qunaitera, in south-west Syria, which suggest that the regime fully orchestrated the “Nakba Day” raids of Palestinian refugees into the Israeli-occupied Golan Heights on May 15. The document (below) which bears the Syrian Republic emblem, is dated May 14, 2011 and describes an “urgent meeting” of Major General Asef Shawkat, the Deputy Chief of Staff for the Armed Forces, and the chiefs of security and military intelligence branches in the province in Al-Qunaitera, which is located at the Syrian-Israeli border. The memorandum outlines how the regime ordered the dispatching of 20 buses, each one with a passenger capacity of 47, to cross the border into Majdal-Shamms in the Golan Heights in order to precipitate a confrontation between Palestinian refugees and Israeli soldiers and UN peacekeeping forces, thereby distracting international attention from the Syrian revolution. All security, military, and contingent units in the province, Ain-el-Tina and the old al-Qunaitera are hereby ordered to grant permission of passage to all twenty vehicles (47 passenger capacity) with the attached plate numbers that are scheduled to arrive at ten in the morning on Sunday May 15, 2011 without being questioned or stopped until it reaches or frontier defense locations. Permission is hereby granted allowing approaching crowds to cross the cease fire line (with Israel) towards the occupied Majdal-Shamms, and to further allow them to engage physically with each other in front of United Nations agents and offices. Furthermore, there is no objection if a few shots are fired in the air. Captain Samer Shahin from the military intelligence division is hereby appointed to the leadership of the group assigned to break-in and infiltrate deep into the occupied Syrian Golan Heights with a specified pathway to avoid land mines. It is essential to ensure that no one carries military identification or a weapon as they enter with a strict emphasis on the peaceful and spontaneous nature of the protest. The provincial security committee meeting is considered in constant deliberation in coordination with the Center. The first months of 2011 have confirmed Italy’s status as one of Iran’s biggest European trade partners, all while the ayatollahs pursue the means to perpetuate a second Holocaust. Rome is doing business as usual with the greatest totalitarian threat to international peace and security since the defeats of Soviet communism and Nazi fascism, providing a lifeline to an Iranian regime that is cruel at home, sponsors terror abroad and preaches anti-Jewish revolt. Meanwhile, a murky wave of anti-Israel zeal is also growing at an alarming rate in Italy. “The old anti-Jewish libels are now aimed at the State of Israel”, says Stefano Gatti, one of the top researchers at the Center for Documentation in Milan. L’Unità, the official newspaper of the leftist Democratic Party, published an interview with anthropologist Nancy Scheper-Hughes, where she claimed that Israel is a world leader in organ trafficking. The accusation resembled that of the Middle Ages blood libel whereby Jews were accused of kidnapping Christian and Muslim children before Passover in order to murder them and use their blood for matza. Until the Arab Spring, nothing had stirred in Syria in nearly three decades. President Hafez al-Assad and his murderous younger brother Rifaat had made an example of Hama in 1982 when they stamped out a popular uprising by leveling much of the city and slaughtering thousands. Now, the circle is closed. President Bashar al-Assad and his younger brother Maher, commander of the Republican Guard, are determined to subdue this new rebellion as their father did in Hama—one murder at a time. In today's world it's harder to turn off the lights and keep tales of repression behind closed doors, but the Assads know no other way. Massacre is a family tradition. It took time for the diplomacy of the West to catch up with Syria's horrors. In Washington, they were waiting for Godot as the Damascus regime brutalized its children. In his much-trumpeted May 19 speech from the State Department—"Cairo II," it was dubbed—President Obama gave the Syrian ruler a choice. He could lead the transition toward democracy or "get out of the way." Secretary of State Hillary Clinton has since used the same language. But one senses this newfound bravado is too little too late. With fighting in Afghanistan and Iraq and now Libya, few leaders in the U.S. or Europe want to see the Assad regime for what it truly is. Yet the truth is there for all who wish to see. Ask the Syrians deserting their homes and spilling across the Turkish border about the ways of Bashar and his killer squads and vigilantes with their dirty tricks. They will tell us volumes about the big prison that the regime maintains. Arab bloggers with a turn of phrase, playing off the expression of "only in Syria," have given voice to the truth about this dreadful regime. Only in Syria, goes one formulation, does your neighbor go to work in the morning and return 11 years later. Only in Syria does a child enter prison before entering school. Only in Syria does a man go to jail for 20 years without being charged and is then asked to write a letter thanking the authorities upon his release. The list goes on. At last, in Damascus, the mask of this regime has fallen, so late in the hour. An estimated 3,000 mourners on Saturday filed through the coastal city of Latakia for the funeral of one of at least nine protesters shot dead by security forces the day before, activists said. Around the country, 25 people were killed on Friday, including three in the Qabun district of Damascus, after protesters took to the streets following the main weekly Muslim prayers, activists said. As the death toll mounted, detailed accounts emerged from some of the thousands who fled to Turkey from the bloodshed in the northwestern town of Jisr al-Shughur. Among them were Syrian army deserters who told of atrocities committed by soldiers in suppressing protests, who themselves were under the threat of execution if they disobeyed orders. Tahal al-Lush described the operation, in Ar-Rastan, a town of 50,000 people in Homs province, that had pushed him to desert. "We were told that people were armed there. But when we arrived, we saw that they were ordinary civilians. We were ordered to shoot them," said Lush, with a blank stare in his eyes. "When we entered the houses, we opened fire on everyone, the young, the old... Women were raped in front of their husbands and children," he said. He showed his military passbook and other papers as proof of identity. A second conscript, Mohammed Mirwan Khalaf, said he had been in a unit stationed at Idlib, near the border. "Just in front of me, a professional soldier pulled out his knife and stabbed a civilian in the head, for no reason," he said. In the Turkish city of Antakya, Nabil, one of the last Syrian aid workers out of Jisr al-Shughur, recalled the roar of helicopters and a "skull split in two" before he collapsed with a bullet in his back. The United States Navy intercepted a North Korean ship it suspected of carrying missile technology to Myanmar two weeks ago and, after a standoff at sea and several days of diplomatic pressure from Washington and Asia nations, forced the vessel to return home, according to several senior American officials. MJT: What’s up with this second Turkish flotilla to Gaza? Surely the government knows about it if you and I know about it, and the government clearly did not try to stop it. What is Ankara hoping to achieve with this stunt? The government also refuses to pressure İHH to stop the new flotilla, saying it is a civilian initiative and, as a democratic country, it cannot intervene in the decisions of civil society groups. “It is an Orientalist belief that nongovernmental groups in Turkey move when they are told by the state to move and stop when they are told to do so,” he said. Do not be skeptical: I suspect he’s telling the truth. It is a very telling statement. They can’t control this little monster they nourished. It looked so cute when it was a puppy, but now that thing weighs 800 pounds. They’re just praying that if they keep feeding it, somehow it will stay focused on Israel, not them–oh, and on Syria, by the way. Lately the IHH has been staging protests in Istanbul against the Syrian regime. That’s awkward, too. These turbines produce small amounts of electricity at great cost to the taxpayer and electricity consumer. The money being invested would be far better spent developing nuclear power – especially thorium reactors, which have none of the risks and waste associated with the uranium fission cycle. Thorium is a cheap, clean and safe alternative, and there are plentiful deposits in Cornwall and in Wales. are the true heirs of the 19th-century Luddites, standing in the way of an energy policy that would benefit us all – and protect our landscape. Please join us for an amazing evening when Bruce Bawer returns to Ottawa with his colleague Hege Storhaug to speak on the problems of immigration in Europe. 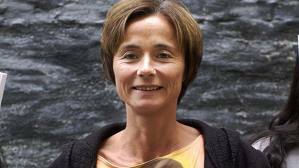 Hege Storhaug is the information director of Human Rights Service in Norway and the author of several books on immigration and integration, forced marriage, women in Pakistan, and related subjects. "Bruce Bawer has yet again written an excellent book....I truly hope that it will serve as an eye-opener for everyone." 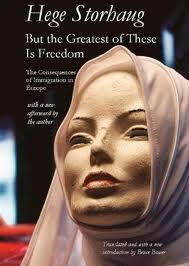 Bruce has translated Hege's new book, "But the Greatest of These Is Freedom: The Consequences of Immigration in Europe." The authorized English translation of the explosive Norwegian bestseller about the consequences of immigration in Europe. For more details on tickets, please visit our web site. And Fatah is the moderate faction! Fatah has never recognized Israel’s right to exist and will never do so, according to Azzam al-Ahmed, a member of the Fatah Central Committee who is closely associated with Palestinian Authority President Mahmoud Abbas. Ahmed, who is also head of the Fatah negotiating team with Hamas, said PA security forces in the West Bank were arresting Hamas supporters to protect them from being targeted by the IDF. Ahmed’s remarks were made in an interview with the Egyptian newspaper Al-Masry Al- Youm. Kudos to the SF Giants for making an anti-homophobia video! But hyperbolic climate rhetoric doesn’t scare as many people as it used to. Gallup reported in March that of nine leading environmental issues, global warming is the one Americans worry about least. In Britain too, as The New York Times noted last spring, fear of climate change has receded, as more and more people conclude that the dangers have been over-hyped. Take the recent increase in global CO2 emissions. Is the Guardian’s panicked anxiety — “Climate on the brink’’ — really a sensible response? Writing in the journal First Things, the distinguished Princeton physicist William Happer makes a compelling case that rising carbon-dioxide levels are neither unprecedented nor anything to fear. “Carbon is the stuff of life,’’ he points out. “Our bodies are made of carbon.’’ Yes, atmospheric CO2 is higher today than it was before the industrial age — 390 parts per million now vs. 270 ppm then — but there was a time when “CO2 levels were several thousand ppm, much higher than now. And life flourished abundantly.’’ Indeed, greenhouse operators artificially boost CO2 concentrations in order to grow better flowers and fruit.